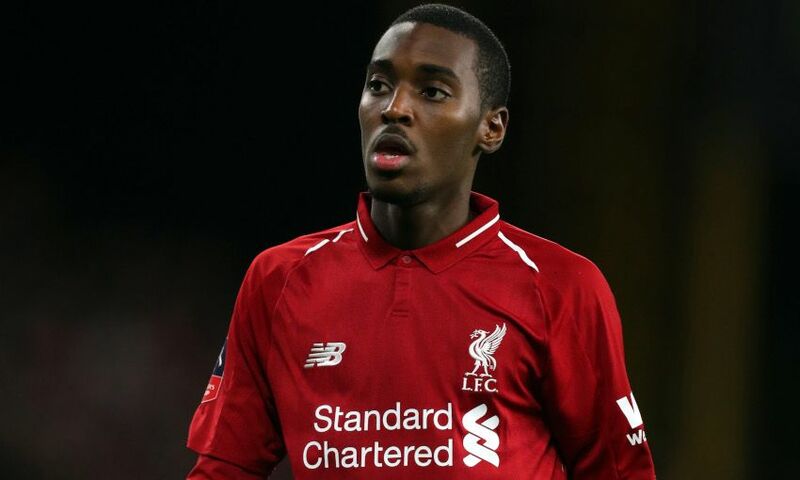 Rafael Camacho scored a second-half hat-trick as Liverpool U23s beat Leicester City 6-0 at the King Power Stadium on Sunday to climb up to third in the Premier League 2 table. The Portuguese youngster hit a thundering effort into the roof of the net just after the break, poached one on the line and completed the scoring with an assured finish into the bottom corner with nine minutes to go. Rhian Brewster, making his first competitive appearance since January 2018, opened the scoring after just five minutes and then won a penalty for Ben Woodburn to dispatch and double the lead on 16 minutes. Curtis Jones made it 3-0 before the half-hour mark, firing into the bottom corner after a mazy run to put the Reds in complete control on a day when Joe Gomez and Alex Oxlade-Chamberlain both started for the U23s as they continued their rehabilitation from long-term injuries. Gomez made his first appearance since fracturing his leg in the senior side's 3-1 win at Burnley in December and was a key figure at both ends of the pitch before being substituted with around an hour gone. Starting on the right of defence, the England international enjoyed plenty of early touches as the Reds probed down that flank and it was his pass that eventually led to an early penalty shout. With just two minutes on the clock, Brewster took a tumble in the box, but the referee waved away the visitors' appeals. 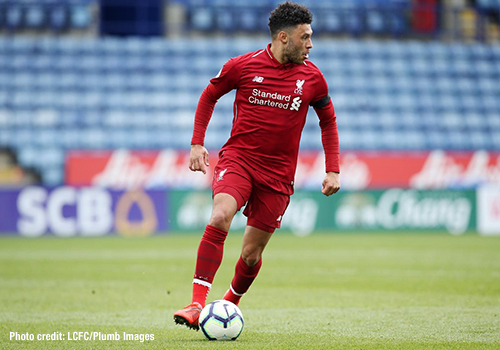 Oxlade-Chamberlain, who featured for the young Reds at the beginning of March, started the match as he stepped up his recovery from a knee ligament injury and set up the opening goal, before eventually going off at half-time. The England international's long-range drive after five minutes was parried by Leicester goalkeeper Tobias Victor Johansson and Brewster was on hand to tuck away the rebound. The home side sought an immediate response and shortly after Layton Ndukwu had fired high and wide from the edge of the box, Reds 'keeper Shamal George had to be on full alert to shovel an in-swinging corner out from under his crossbar. 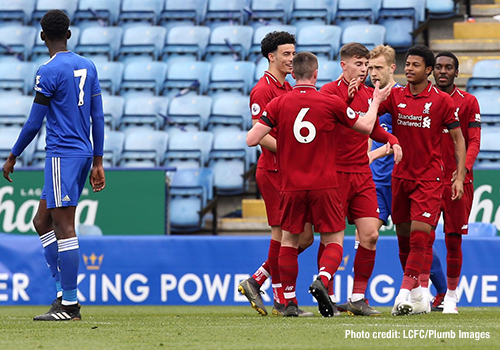 However, Liverpool quickly regained control at the King Power and doubled their lead from the penalty spot with just over a quarter of an hour gone. The effervescent Brewster took a high boot from defender Luke Thomas as he stooped to head Jones' wonderfully lofted cross from the left - and Woodburn made no mistake from the spot. Jones made it 3-0 on 27 minutes after some robust work in midfield saw Woodburn launch a counter-attack. The LFC No.11 took possession and twisted and turned his way into the box before firing low through the legs of Foxes skipper Sam Hughes and into the bottom corner. Liverpool continued to pile the pressure on their hosts, with Oxlade-Chamberlain driving at the defence with a trademark run and Gomez galloping forward on the overlap to tee up Camacho, who dragged a low shot wide of the far post. Gomez was at it again moments before the break, bringing the ball out of defence before playing an inch-perfect, defence-splitting diagonal pass for Jones. But on this occasion, the Foxes 'keeper was equal to the forward's low shot. Liverpool continued where they left off after the break as Camacho blazed a finish into the roof of the net on 50 minutes to make it 4-0. 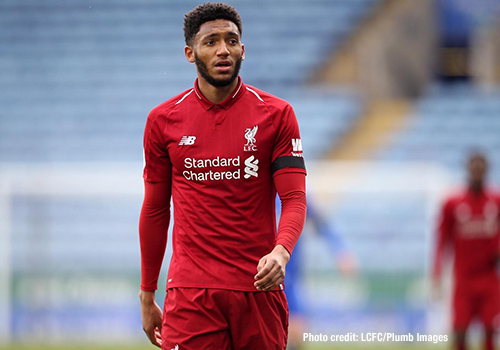 But despite the comfortable lead, the Reds had to remain alert at the back and Gomez took a break from his attacking forays to make a last-ditch tackle on Lamine Keba Sherif to deny a clear goalscoring opportunity for the hosts. Brewster thought he had got his second of the match on the hour mark as he rounded the 'keeper and fired off a shot at goal. But with a Foxes defender closing on the ball, Camacho made sure, poking it in on the goalline. Now searching for his hat-trick, Camacho seemed an almost constant threat and was inches away from grabbing his third when he struck the outside of the post. A last-ditch block denied the 18-year-old a goal moments later and when Leicester rallied and forced George into a brilliant low save late to preserve his clean sheet, it looked like the chance had gone for Camacho. However, with nine minutes left to play, the LFC No.7 took possession on the edge of the box and fired a low finish past Johansson to complete his hat-trick and the scoring for Liverpool. Liverpool U23s: George, Gomez (Masterson, 60), Lewis, Hoever, Johnston, Coyle, Camacho, Oxlade-Chamberlain (Christie-Davies, 45), Brewster (Gallacher, 75), Woodburn, Jones.